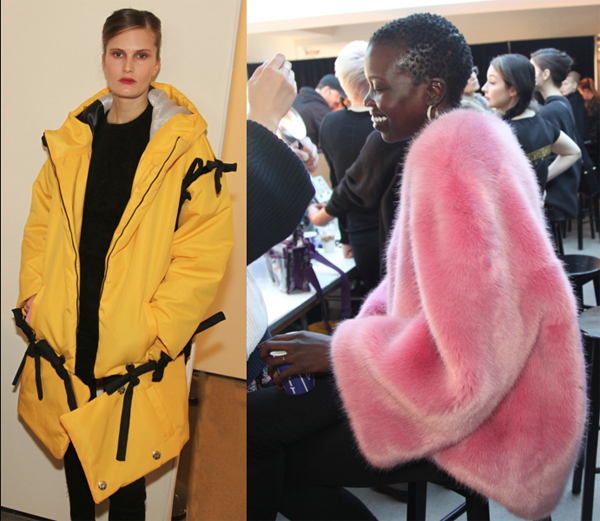 Home » Posts Tagged "Blikvanger Coat"
Seen on Scene, two great coats on two great international models worn backstage at the Badgley Mischka New York Fashion Week Show for Fall 2018, on the 7th floor of Spring Studios. On the left is Alla who describes herself as a fashion Insider, model, tv host to her 716K Followers on Instagram (@alla) She is wearing an eye-catching yellow coat by Blikvanger. On the right is Nykhor in an delicious pink fur Annakiki top. She describes herself as an International Model/Activist to her 86.6K instagram Followers (@Nykhor) Stay tuned for the Peter Gray hair for Nume and Gucci Westman makeup or Ingot, and more Fab Fashionistas, all to be archived forever with larger photos on this website.